I-95 - Head South. 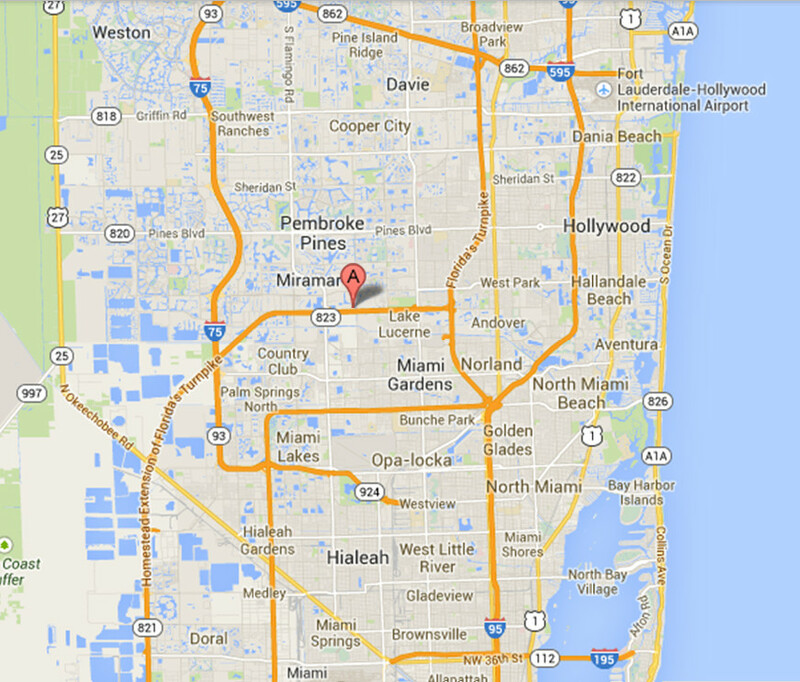 Take exit 19 for FL-824 / Pembroke Rd, go West (right) follow signs for Pembroke Park and merge onto W Pembroke rd. Turn left onto University Dr, turn Right onto Miramar parkway, turn Left onto Commerce Parkway. Turnpike - Follow turnpike South toward Homestead, merge onto FL 821 South, Take Exit 43 Red Rd / NW 57th av / FL823, continue straight, Slight right onto NW 111A / Red Rd, 1st Right onto Marks way, Right onto Enterprise way, Right onto Commerce Parkway. I-75 - Head South to I-75S / Miami. Take exit 7A for E Miramar Parkway. Merge onto S33rd st / Miramar Parwkay. Turn Right onto Commerce Parkway. I-95 - Head North on I-95 / Fort Lauderdale, Take the Exit 12A on the left for Florida 826W / Florida's turnpike. Keep left and follow signs to turnpike and merge onto Florida's turnpike (toll road). Take Exit 4X toward Homestead. Merge onto Fl 821 South. Take exit 43 for Red rd / NW 57 av / FL-823. Continue straight. Slight right onto NW 111A / Red Rd, 1st Right onto Marks way, Right onto Enterprise way, Right onto Commerce parkway. Ddestination will be on the right. 826 - Head North on 826N. Exit NW47th avenue, merge onto NW 167th street, turn Left onto NW 47th avenue, Continue onto Palm avenue, turn Left onto USA Today way, turn Left onto Commerce Parkway.